The famous Sarriball has arrived in England. Chelsea accepted Maurizio Sarri as their new coach, and with him, one of the most intricate and complex systems Italian football has to offer. The veteran from Naples replaced a struggling Antonio Conte in the hopes of rejuvenating Chelsea and bringing them to glory once again. It’s safe to say that regardless of the resurgent start of his English odyssey, Sarri has seen better days in his coaching years. Chelsea have been playing poorly, and their title dreams are practically out of reach just over halfway through the season in the Premier League. The team seem to be losing faith, and Sarri his control over them. But what exactly is the problem here? Why does the famous Sarriball not work in England when in Italy it was a revolution? Is the problem in the mentality, or maybe the players themselves? Perhaps it’s just the difference in style between English and Italian football? 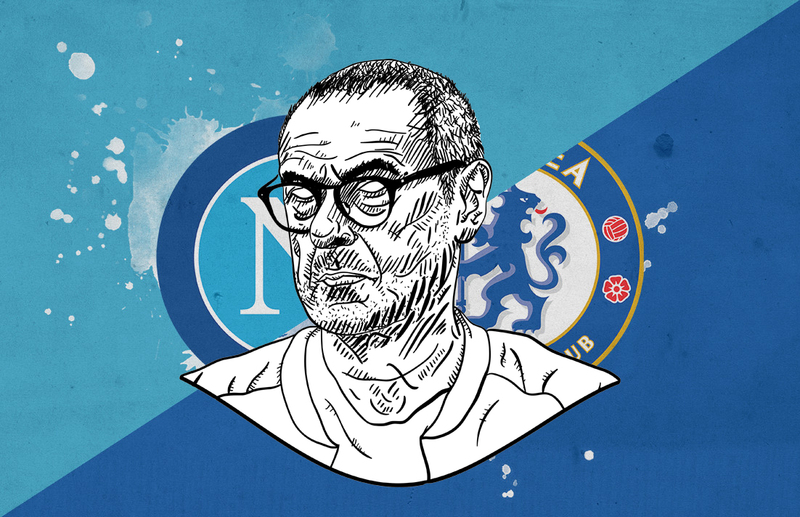 This tactical analysis will use statistics to try and find the solution to the mystery at hand: what is the reason behind the fall of Sarriball at Chelsea, and what seems to be different from Sarri’s time at Napoli? 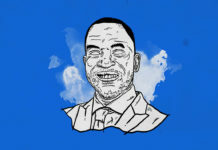 With the lack of a more professional term, Sarriball refers to an open, attacking and more crucially, fluid type of football that bears a close resemblance to the Spanish tiki-taka implemented by Pep Guardiola during his time at Barcelona. Some of the key features of both Sarriball and tiki-taka include but are not limited to high tempo games, pressing the opponent higher up the pitch, and dominating possession throughout the match while building from the back. This usually resulted in beautiful and most of all entertaining football back when Sarri was in charge of Napoli. Even though he never claimed any silverware to speak of, Maurizio Sarri was still held in high regard exactly because of the football his team played, and how it presented the modern way of approaching the beautiful game. It was a reference to all, and the Italian coach was in high demand. As his time in Napoli was coming to an end, he was quickly snatched up by Chelsea as the blue side of London found itself lost and in need of new guidance. They hoped it would somehow manifest itself in this Italian veteran and would eventually guide them back to the top. For all its glamour and style, Sarriball has somewhat drowned on the cold and muddy English pitches as the Italian’s time in London seems to be coming to an abrupt end, barely six months into the job. And as his clock almost strikes midnight, what better time to reflect on what exactly did go wrong for Sarri at Chelsea. Back at Napoli, Maurizio Sarri really had one preferred option when it came to a certain system or a favoured formation to use. An overwhelming 92% of the time, he opted for a 4-3-3 system while he used 4-1-4-1 and 4-4-2 only 2% of the time, implementing it in experiments only or when some other circumstances prevented him from choosing his favourite system. In this system he would always have three midfielders, two of which were positioned higher up the pitch with more attacking roles. The other played the role of a holding midfielder or a pivot, and was more defensively oriented. His attacking trio was usually set up in a narrower shape to make way for the overlapping full-backs who were his main width providers. As he had a great attacking threat in Faouzi Ghoulam, the left side was somewhat preferred for Napoli. On the pitch, it looked something like this. Napoli’s default 4-3-3 formation under Maurizio Sarri. Now we’ll dissect all aspects of their game, starting with their attacking capabilities. In the 2017/18 season, Napoli had great numbers to back up their exceptional football. The Italian giants ended the season with 1.64 xG (0.8 conceded) with 57.68% possession on average. Attacking-wise, they were a well-oiled machine, placing 40.8% of all of their shots on target (averaged 15.98 per game) with just under half (49.7%) of all offensive duels won. Sarri had a distinct plan when attacking and it mostly revolved around positional play. On average, his team recorded 38.44 positional attacks while only resorting to counters 2.56 times. Still, the latter strategy also proved to be potent enough with 36.7% of all those counters ending with a shot on target. Needless to say, Napoli had multiple ways of hurting their opponents and knew how to use all the weaponry at their disposal. Let’s take a look at how that looked like on the pitch. A key principle in Sarri’s Napoli when building from the back: centre-backs stay wide, the full-backs can go higher up the pitch while the pivot drops deeper to receive the ball. With Maurizio Sarri every attack started right from the back, with the goalkeeper having great communication with his midfield. Notice above, and below, how the centre-backs stay wide and allow one midfielder to drop deeper to receive the ball. This lavolpiana position was used to orchestrate from a position that offers more freedom but also to help the team get rid of the opposition’s press. When the centre-backs assume their wide positions, the full-backs can burst forward to attack. Once again, the same thing happens as already mentioned above. The attack starts from the back line and the ball is moved further up the pitch by a dropping midfielder who assumes the lavolpiana role (between the centre-backs). Once again, the defensive midfielder drops deeper to receive the ball and to send it further up the pitch, through the middle and onto the flanks. As we have already stated, the left was prioritised as Napoli used it to attack 46% of the time last season and a little less (40%) back in the 2016/17 campaign. The front three would form a narrower shape, and let the wide areas be occupied by their full-backs. Note below how that transitions onto the pitch. In attack, Napoli would focus on the left flank with the overlapping full-back. The attacking trident would stay narrow so the overlap would be successful. Quick breaks were a big part of their arsenal but not something they would solely rely upon. In a scenario where they faced a deeper and more compact block, Napoli pinned the opposition down with their high defensive line. This was largely evident in the 2017/18 season but was present throughout Sarri’s mandate in Naples. They had ways of getting through the lines and breaking them when needed, but building slowly and from the back was something Sarri was also known for. When met with a medium or high-block, Sarri’s Napoli would still maintain their high defensive line, which made them more aggressive but also vulnerable in transitions and to through balls behind the back line. Here, the opposition sets up a mid-block when welcoming the sky-blue team into their own half, putting their forward relatively high up the pitch near the centre. Napoli allow their defensive line to go as high as the middle of the park and start building the attack from there. With 1.98 goals on average last season Sarri’s troops seemed to flourish in this attacking system, but how did they fare defensively? Defensively, we could say that Sarriball was somewhat susceptible as they let through 8.7 shots on average with 36.4% of those being on target, as well as only winning a meagre 22.1% defensive duels last season. Still, as was the case when attacking, Maurizio Sarri had a distinct style when defending, and once again, it all revolved around positional play. 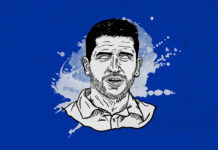 He had a preferred shape in defensive transitions as well as recovering the ball, but the shape of the team would largely depend on the attackers in the first place. In a looser translation, the positioning was more fluid than fixed and prone to changing according to the opposition. Their off-the-ball movement was key in this aspect as Napoli never liked being out of possession for too long. For that exact reason, pressing high and well were the priorities when defending, as can be seen below. Napoli’s main defensive aspect is the high press that shuts down all passing options for the opposition. The pressing game was a focal point of Sarriball. When you lose the ball, you try to regain it almost instantly, and as high up the pitch as possible. If the opposition went as far back as the goalkeeper, the forward trio, with the support of the midfield, would block all passing channels and force them to go long or risk having the ball stolen. The press would mostly occur in a 4-1-4-1 formation as the striker was the first in line to initiate it, followed by a midfield quartet or either of the wingers, depending won which side the ball was on. This would in turn change the pressing shape into a 4-4-2 with two men up front, supported by a crowded midfield. If, however, Napoli were forced back, they would do the same but with a more compact shape. Notice how they force their opposition wide by maintaining low distances between themselves, making it difficult to penetrate the block. 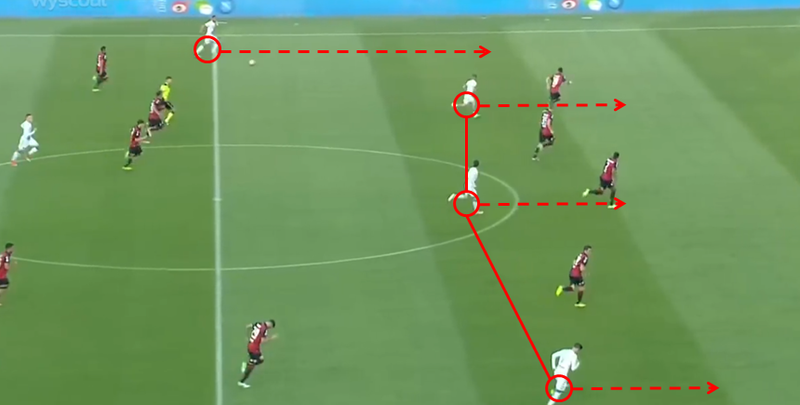 If the press was breached, however, Napoli would often revert to a compact low block, forcing the opposition to the wings and preventing any attempts through the middle. But the idea was never to sit back and hope for the best. When Napoli got their opponent to circle aimlessly, that’s when they were ready to pounce for the ball. In those situations, Sarri would deploy his team in a 4-5-1 formation, with the striker at the ready for a counter, and a packed middle of the park to secure the chances of regaining possession. Even when pinned back, Napoli would still press the ball carriers and force mistakes that would often translate into deadly counters. Notice above how Napoli blocked the access to Roma’s attackers. Their pressure forces them to go around and backwards, eventually making a mistake under pressure, which results in a dangerous break for Sarri’s team. In general, when speaking about Sarriball in Serie A, it was an offensive strategy that resulted in lots of goals, mostly for Napoli, but also for the opposition as well. The 2017/18 season is still a bit of an exception as Sarri probably reached his peak in attacking and defending extraordinarily well. The numbers do support that thesis with 1.98 goals scored on average and 0.89 conceded. Still, a year prior to that, the situation is even clearer with 2.42 goals scored but with 1.11 conceded. Just by looking at that, we can say that Napoli scored a lot but were also prone to conceding due to their open and ever-attacking state of mind. The Italian certainly tried transitioning those positive things from Napoli to Chelsea but something definitely did go amiss. A lot was expected of Maurizio Sarri when he arrived at Chelsea. Antonio Conte left it in a shambles when fled the crime scene, and it was up to the new man to pick up the pieces. At first, it seemed like a match made in heaven. The Italian brought Jorginho with him, and the pieces were all set to continue the tradition of Sarriball. Once again, he tried implementing the same tactics as before, hoping that similar results would follow shortly after. Maurizio Sarri’s default Chelsea 4-3-3 formation. The similarities can already be seen as an overwhelming 75% of the time Sarri has opted for a 4-3-3 formation. This time, he has been more prone to changes, so a more experimental 3-4-2-1 has been used a relatively high 9% of the time, at least compared to his time at Napoli when he exclusively used one system. The rest (16%) belongs to formations used less than 2% of the time. The high emphasis is again in the midfield and attacking from the back. The goalkeeper and centre-backs have a big role both as attacking and defensive outlets as everything starts with them. As was the case with Napoli, the full-backs were almost always positioned wide, and a defensive midfielder (Jorginho), drops deeper to receive the ball. The emphasis is once again on the left side as the more attacking-oriented Marcos Alonso plays as Chelsea’s left full-back, as opposed to Cesar Azpilicueta, who is more defensive-oriented and doesn’t venture as high up the pitch. His two attacking midfielders have somewhat different roles. Ross Barkley or Mateo Kovačić are his offensive outlets, while N’Golo Kante gets to go higher up the pitch but also provide defensive backup. A similar thing happens to the wingers as well. Eden Hazard has complete freedom in attack on the left, while the right wing has more defensive duties. We’ll dissect Chelsea just as we did with Napoli, starting with the attacking aspects of their version of Sarriball. Halfway through the season, Chelsea are sitting on 1.63 goals scored on average and an xG of 1.61. Also, the Blues can boast of 61.95% average possession dominance which still remains one of the key principles adopted by the club under Maurizio Sarri. They take 14.98 shots per game, 34.9% of which are on target, and win 53.2% of their offensive duels. When it comes to a clear game plan, Sarriball is in full effect with the team clearly prioritising positional attacks (34.58 per game) over a counter-attacking style of football (2.58). A clear resemblance with Napoli can be seen in Chelsea’s build-up for the attack. As we have stated before, the team will almost always try to form their attacks through possession and vertical passing. They achieve this through a simple plan. Once again, Jorginho is the focus at Chelsea, just as he was at Napoli. He drops deeper to receive the ball, while the centre-backs and the full-backs go wide. Jorginho is the key in Sarri’s lineup, similar to his role at Napoli. The defensive midfielder drops deeper down the pitch to assist the back line in progressing the ball upward. The centre-backs will stay wide, as will the full-backs, to provide a passing option in case of a high opposition press, as is the case in the image above. The main aspect of ball-advancement lies in moving the opposition player to create pockets of space to send the ball through. Jorginho offers an extra passing channel between himself, the centre-backs and the goalkeeper while there’s always an option to go wide onto the flanks if the press is too strong. Maintaining possession and low risk of losing it is of the utmost priority in this scenario, and thus requires both the centre-backs and the man between the sticks to be skilled with their feet. Notice how Chelsea invite pressure only to get rid of it by dropping midfielders deeper and creating pockets of space to exploit. Here, we see Chelsea in a shape described above with centre-backs and full-backs wide, and a pivot dropping deeper to help deal with Manchester United’s press. Jorginho and Kepa lure the markers in, creating space for Alonso on the left. 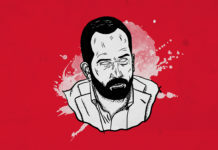 Once the Spaniard receives the ball, red shirts start coming down on him. This is when the extra man from midfield drops to receive the ball, and a simple one-two frees them to continue the attack, which is once again focused on the left side of the pitch. The goal is to get the ball to the opposition half by vertical passes and then move it to the wings. A quick combination sets the Chelsea midfielder free and ready to continue the attack. When the ball does reach the final third, mostly on that left flank, Chelsea often rely on Hazard’s individual prowess to get them over the line. Because of this resposibility, the Belgian’s form and mood sets the tone of the game. Still, Sarri’s problem has also been the lack of a prolific and, more crucially, a consistent striker who would benefit from the Blues’ chance creation. Sarri also successfully transitioned the defensive trend he set at Napoli to Chelsea. The same style of high-press and blocking the passing channels has remained but it has also arrived with the same setbacks. This season, Chelsea average 0.92 goals conceded with the xG (also goals conceded) value of 0.93. The Blues have also allowed 8.85 shots per game with 35.6% of them being on target. Finally, they win only 23.3% of their defensive duels which is also on the lower side for a top team. For the majority of their games, Chelsea have started with a high press. It hasn’t been an extremely erratic press but mostly an organised one which favours good movement over too much exertion. Chelsea often press their opposition high up the pitch but also look to block the channels rather than press with great intensity. Similar to Sarri’s Napoli, his Chelsea are well-organised in their pressing game. They do position themselves high up the pitch but with the intention of blocking the passing lanes as well as forcing the opposition into mistakes. The goal is once again to regain possession in the final third, where the attack can immediately be reset in case of a won ball. As of late, however, and against teams that are capable of bypassing that press and quickly transitioning behind Chelsea’s defence, Sarri has decided to change his game plan just a tiny bit. In those scenarios, when his opposition knows well how to exploit his high defensive line, he opts for a 4-5-1 defensive shape that can occasionally turn into a 4-4-2 when one of the wingers goes higher to assist the striker in the press. Against teams that have the ability to exploit Chelsea’s weaknesses, Maurizio Sarri deploys a 4-5-1 system. When one of the wingers or a midfielder, usually Kante, moves higher to support the press, the team systematically swaps to a 4-4-2 formation but always prioritises numerical superiority in the middle of the park. If their mid-block is breached and they fail in their attempts to get the ball in an advanced position, Chelsea tend to fall back into a really compact shape, reminiscent of the one seen in Napoli’s case where they focus on overcrowding and quickly pinning down the ball-carriers. This is usually the case against teams that have the ability to pass well through the lines, and that are mostly press-resistant. Chelsea overcrowding Manchester City in the middle, preventing further penetration by collapsing on the ball-carrier. The similarities between Sarri’s Napoli and his Chelsea are glaring. We could go as far as to say that they seem like exact replicas of each other. The way they attack and defend scream Maurizio Sarri. You have to hand it to the Italian: he did stay true to his word and his philosophy. So how come Napoli were so successful using the tactics of Sarriball and Chelsea, even though they seem to be doing the exact same thing, are struggling? The answer in that may lie in a couple of different reasons. The first one might be the very fact that both teams use the exact same system with almost no visible differences. Sure, Chelsea are not as proficient at carrying the ball upwards through their centre-backs and they might have adopted a different defensive system as of late, but you cannot look past all the similarities. It might be that Sarri, given the stage of his coaching career that he is at, will most likely never change. His opponnents have just adapted to that and learned how to counter or completely negate it. Usually, there is no plan B for Sarri so if plan A fails, the game is as good as lost. With Jorginho as the main cog in his machine, teams have learned to either man-mark him out of the game completely or found ways to shut down his passing channels, rendering him mostly useless. Jorginho is the key to Maurizio Sarri’s system, both at Napoli and Chelsea. Teams have, however, learned how to deal with him, cutting him off from the rest of the team. The other reason takes us back to his early Napoli days. We often hear that Sarriball is a long process and the results will only be visible long-term. That sounds like a class excuse but there is some substance to it. It did take Sarri more than a full season in Italy to finally get going and create a team as dominant as his prime Napoli was. Being in London for only six months means that the team is still pretty much learning how to play that mysterious Sarriball, and at the moment, there certainly is a lot of room for improvement. Given that many of Chelsea’s players have been given new roles and different tasks to what they were used to, these results are not really that surprising at all. Take N’Golo Kante as the prime example to support this thesis. The Frenchman is no longer classified as the destructor but now plays as a number eight of sorts, drifting forward and backwards on the pitch, depending on the situation. But even though Sarri’s combination of Jorginho and Kante, two very different profiles in their essence, sounds risky, it actually has its benefits. Kante does have the ability to accelerate and move the ball forward, and Jorginho can slow the tempo down and dictate as the team needs him to. This brings about an interesting change of dynamics and gives Chelsea different options to approach different situations on the pitch. A different problem occurs in short-term goals and expectations. Is Maurizio Sarri a bad coach for bringing Chelsea to this dire situation? No, not really. But the thing with modern football is that not a single top team can play for long-term results. They all need the results right NOW. As much as it sounds like making excuses, Sarriball is a process. It’s also a bit of “what you see is what you get” because Sarri is not going to be the one to change his style. With him, either the team adapts to his ideology or they suffer. But the numbers do suggest that Napoli have been much quicker in adapting to Sarri’s demands than Chelsea have been. For a more statistics-driven analysis and proof of that thesis, head over here. Chelsea are unfortunately at breaking point but it doesn’t necessarily have to spell doom for the Blues. There is still time to change things. Will the Italian veteran be willing to sacrifice his pride and mix things up in order to get out of this slump? Funnily enough, only time will tell.